Do women need to eat very differently from men? Are their nutritional needs different from others? Do their needs change with age? These are the most common questions that we come across while talking about nutrition. Women don’t need an entirely different diet from men. The basic dietary guidelines remain the same for both genders. However, a woman’s nutritional needs are different at different stages of her life – pregnancy, lactation and menopause. The top 3 nutrients that come to mind when you think of women’s health are calcium, iron and folate; and the most common health concerns that bother women are weight, aging and menopause. Let’s look at each of them briefly. 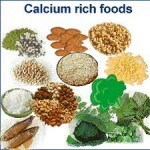 All of us deposit calcium in our bones. The balance between deposition and resorption changes with age. As we move towards middle age, the rate of bone building decreases. Menopause heightens the rate of bone loss and therefore calcium is a concern for women. As long as there is adequate calcium intake thru foods and there’s no calcium deficiency, supplementation thru calcium tablets are not needed. Calcium is found in whole pulses (soybean, horse gram, channa, etc), ragi, dairy foods, green leafy vegetables, fish, sesame seeds, cumin seeds, almonds, etc. About two-thirds of iron is found in haemoglobin in the body. Poor food habits and iron loss during menstruation are the main causes for iron deficiency in women. It is vital that iron is replaced thru foods and healthy eating. Some of the iron-rich foods are dark green leafy vegetables, dates, black currants, rice flakes (aka beaten rice, poha), bajra, meats, soybean, water melon. The iron present in meats is easily absorbed by the body but the iron present in plant foods need the help of vitamin C for absorption. So, vegetarians will require lime juice, fruits like guava, berries, citrus fruits, etc to help in absorbing iron into the body. Tannins in tea and phytates in whole grains can decrease iron absorption. Iron supplements are to be taken only when there’s a deficiency or when there’s an increased need for iron in the body. Apart from its importance in pregnancy and other functions, folate also plays a role in heart health by keeping homocysteine levels under control. Folate is one of the nutrients that helps to reduce the risk of heart disease. This B vitamin can be obtained from spinach, cluster beans, lady’s finger, sesame seeds, methi seeds, egg, bajra, whole pulses, etc. Women are most concerned (sometimes obsessed) about their weight. A well balanced eating pattern which provides all the nourishment, along with regular exercise helps to keep the weight in check. Many women believe that post partum weight is difficult to lose, or that menopause brings in weight gain. This is not true. With a proper schedule for food and exercise, it is possible to knock-off the post partum weight as well as keep weight gain at bay after menopause. Also keep your body fat under check. Portion control becomes more relevant as we age. If there were a single solution for anti-aging or age-reversal, I’m sure we would all go for it. Aging is a part of life and as long as we age successfully and gracefully, it should not matter how old we are. Women are generally concerned only about external appearances like skin and hair as they age. The internal body parts and functions also need to be taken care of. Healthy lifestyle always helps us to age well. Adequate fluid intake is important as women age because it helps to maintain moisture in the skin as well as prevents urinary tract infection. Nuts with their vitamin E and zinc content are beneficial for the skin too. Fiber needs to be taken in adequate quantities for bowel health. Vitamin D and B12 are a concern as women age. So, do get your D and B12 levels checked after consulting your doctor. Ensure an adequate intake of antioxidants thru foods. This is an unavoidable phase in every woman’s life cycle. While some women sail thru this phase without any problem, others face a lot of ups and downs. Eating healthy is vital during menopause. Spicy foods, hot beverages and alcohol are known to increase hot flushes and night sweats. Avoid these as much as possible. Sugary foods cause a high followed by a low feeling which leads to tiredness. 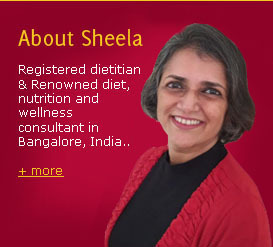 Choose fresh fruits or dry fruits instead of desserts. To calm your mood, take whole grains at mealtimes and warm milk at bedtime. Do not skip meals, particularly breakfast because this helps to maintain your blood sugar levels better. Restrict foods – sodium, fizzy drinks, alcohol, caffeine – that remove calcium from your bones. Include soy and flaxseed in your diet. Graze on food; do not gorge. Do not forget to exercise because this preserves calcium in your bones. If you are a smoker, quit! 0 Comments | Posted by admin at 7:02 am. Leave a comment!